Let’s start with the beginning of the day. It’s early in the morning – still dark outside – and the alarm goes off. If you’re like the majority of American adults, the real motivation to get out of bed is the thought of that steaming cup of coffee. Or maybe your choice drink is a cup of tea, an energy drink, or a coke. Whatever your preference, you know you need your morning fix of caffeine to metamorphose from your zombie state (generally comprised of shuffling feet, messy hair and clothes, and monosyllabic sentences) to a fully functioning adult, capable of human interaction. So, how exactly does this miracle substance work, anyway? Why is it addictive, and is it really “bad” for us? Caffeine works by interfering with your nervous system. Your nervous system is made up of your brain, spinal cord, and billions of nerve cells throughout your body. Altogether, it’s like a huge roadmap that allows all of parts of your body to communicate with one another. The “roads” are made up of nerve cells called neurons that line up end-to-end and specialize in receiving and sending signals. Your neurons communicate with each other by using little chemicals called neurotransmitters. Various neurotransmitters are used for different signals. For example, after you eat a meal rich in fat and protein, your gut uses multiple neurotransmitters like cholecystokinin to signal your brain. Then, your brain coordinates signals to get the digestive process going. Neurotransmitters are also involved in sleep: As you go about your day, the neurotransmitter adenosine is responsible for making you sleepy. When you feel the effects, you know it’s time for sleep – or that venti latte to override the system! 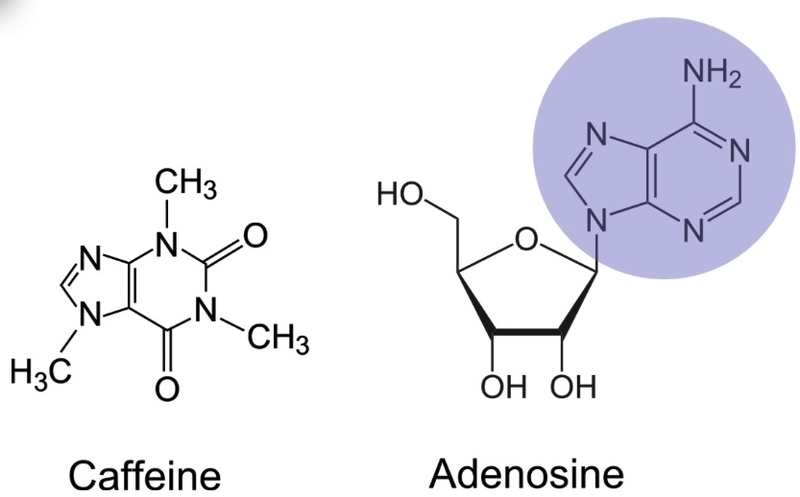 In the case of caffeine, we’re going to take a closer look at adenosine. Adenosine works by building up throughout the day: the longer you are awake, the more adenosine is produced in your system. As it builds up, it binds to specific receptors in your nervous system that send signals to make you more and more tired. When that cup of Starbucks finally kicks in, it’s because the caffeine molecules have actually interfered with the adenosine in your body. 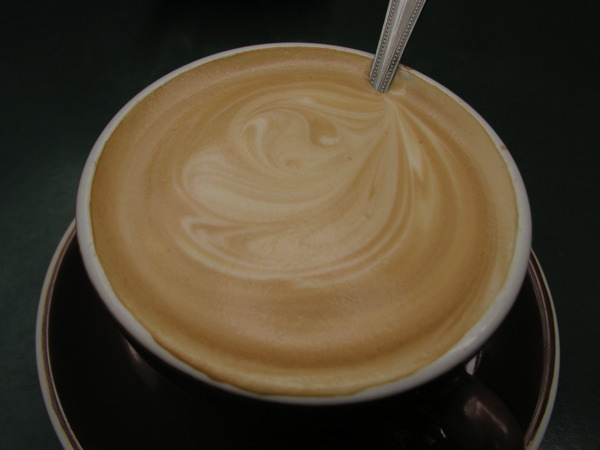 Caffeine is structurally similar to adenosine, so it can bind to adenosine receptors instead of adenosine. Caffeine doesn’t pass on the message that you are sleepy though: it only binds and acts as a blocker. As a result, your neurons fire faster, and you feel awake and energized rather than ready for a nap. Over time, however, the individual starts to notice that the morning coffee isn’t the same. The early morning worker needs a bigger cup to wake up, and the overworked student is reaching for a few cans of Monster to make it through the night. So, what happened to that glorious caffeine buzz? Why doesn’t it work anymore? Unfortunately for our caffeinated friends, it turns out that the nervous system starts to adapt to caffeine when we consume it regularly. You may have heard of this referred to as building up a tolerance. In the brain, adenosine receptors do their work to make your sleepy, and caffeine that you ingest works to counteract it. However, when you drink caffeine regularly, the brain actually makes more adenosine receptors. This means that drinking the same amount of caffeine will have reduced effects because there isn’t enough caffeine to interfere with all of new receptors. Instead, some adenosine is able to bind to the extra receptors. It then takes larger quantities of caffeine to block all the adenosine and get the same effect. If for some reason you don’t take in that daily dose of caffeine (no time for your morning Starbucks run), you may be even more tired than you normally would be because now there are extra adenosine receptors available and absolutely no caffeine to interfere. The signal is very strong, so you get extra sleepy! Caffeine becomes less effective over time, but is it “bad” for you? Well, you may have heard about some shocking, controversial deaths related to excessive consumption of caffeine; the FDA has disclosed several reports of death and near-death associated with products such as 5-hour energy, Monster Energy, and Rockstar Energy Drink. Caffeine is also associated with anxiety and depression, especially in individuals already suffering from mental illness. Additionally, the use of caffeine in beverages causes an increase in soda consumption; the high amounts of sugar in these beverages can contribute to heart disease, diabetes, and obesity. On the other hand, moderate caffeine consumption, especially from coffee, has been linked to a variety of health benefits. Several studies have shown a correlation between caffeine consumption and a significantly lower risk for Alzheimer’s disease and other cognitive impairments. In particular, coffee has been linked to a significant decrease in liver disease and liver cancer. In the end, most health professionals agree that moderation is key. In an analysis of over 200 studies on caffeine, Health Canada reported that 400 mg of caffeine (equivalent to about 3 cups of brewed coffee) is safe in healthy adults. Every individual is different, however, and it’s likely that age, genetics, and other drug interactions can play a role in how well your body responds to caffeine. So, it’s important to listen to your body and refrain from using caffeine as a replacement for proper sleep. While you’re enjoying that latte, keep moderation in mind and remember that caffeine is a drug.